Designed using leading technology and materials, Drager's range of heavy duty airline apparatus is ideal for use where an extended duration of breathing air is called for. Chemical tank cleaning, toxic spillages or certain tasks when working on offshore installations are all made easier and more comfortable when using the PAS AirPack 2. The PAS AirPack 2 is able to accommodate one or two compressed air cylinders of up to 50 litres in capacity and is constructed from an anti-static powder coated steel material. The unit can be supplied with a fully approved lifting eye, enabling safe transfer when elevated working areas may be unavoidable. The rear wheel of the trolley also incorporates an easy to administer foot brake, which prevents any inadvertent movement of the unit whilst in operation. It is available with either one or two pressure reducers and two hose reels allowing joint use of the system or for two completely independent systems to run concurrently. A 50 metre length of hose is supplied with AirPack 2 as standard, this can be extended to a length of 100 metres with a range of extension hoses. 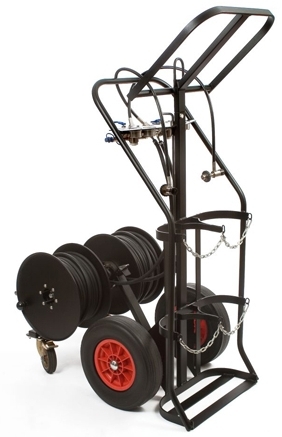 The trolley hose reel connector is protected with a cover to minimise inadvertent damage being caused. The PAS AirPack 2 benefits from the world renowned, tried and tested, pneumatics system used on Drager's successful PSS range of compressed air breathing apparatus. The system incorporates a safety pressure relief valve and the pressure reducer is shrouded in a protective plate for additional safety.